1. Introduction: The diffusion of courseware in Higher Education Likely outcomes of e-learning innovations in higher education using information and communication technologies (ICTs) have been hotly debated, with utopian excitement about the new media matched by critical concerns over their appropriateness in many contexts (Dutton and Loader 2002). With notable exceptions (Hara and Kling 2000), this debate has been illustrated more by anecdotal evidence than empirical research on the actual role of ICTs in higher education. This study seeks to develop an empiricallyanchored perspective on the implications of elearning through a case study, informed by work on the social shaping of technology (SST) that highlights organizational, cultural, economic and other factors influencing the process of technological change and innovation (Williams and Edge 1996; Kling 2000). It provides evidence centred on an indepth analysis of one e-learning innovation, in order to surface patterns and themes of potential relevance to a wider range of elearning initiatives. The innovation we focused on was an institution-wide virtual learning environment (VLE) designed to support the management and operation of most aspects of an online course: the distribution of multimedia material (such as readings, lecture notes, assignments and images); student-teacher and group discussions; exam and grade administration; and other teaching and administrative tasks. We chose to study a VLE because such course management ‘courseware’ systems appear to be among the most rapidly diffusing e-learning technologies across the world.1 The adoption of this kind of environment has become a symbol of innovation, with many higher-education institutions not wishing to be left without their own system. A VLE can also create incentives to invest further in electronic content, create links to other ICT applications within the university, such as wireless networks and services, and generally enable institutional innovations in learning and education. Our study seeks to answer questions such as: What is the actual experience of implementing VLEs? Which main social, cultural, psychological, economic, technical and other factors facilitate or constrain the uses to which the VLE is put? To what degree does a VLE complement or replace traditional learning environments? What kinds of VLE-based teaching and learning approaches are most effective? Which VLE capabilities lead to difficulties or are underused? How easily can a VLE be tailored to the needs of particular contexts, teachers, students, administrators, etc? This applies to both proprietary systems, like Blackboard (www.blackboard.com) and WebCT (www.webct.com), and open source software, such as the Bodington Common (http://bodington.org/index.html). Electronic Journal of e-Learning Volume 2 Issue 1 (February 2004) 69-80 Who in educational institutions are likely to be the winners and losers from the introduction of a VLE? What kinds of policies and resources are needed to make a VLE effective? What are the implications of the way a VLE can be used to reconfigure how faculty, administrators, students and others in an educational institution gain access to people, services, information and technologies (Dutton forthcoming). The following sections describe our methodology, the patterns of eClass adoption and use we identified, and our findings on the main factors shaping these outcomes. support the role of traditional gatekeepers in education, such as faculty instructors, at the same time as fostering new gatekeepers, such as the technology administrators and technical support staff that control access to digital library resources and make decisions about technology upgrades. This SSE background convinced us that we both a comprehensive survey use questionnaire and ‘embedded case studies’ to undertake more detailed interviews that drill down to get a richer feel for the actual issues confronting everyday use of the system. This provided a balance between institutional and user perspectives. Given the significance of instructors to any innovations in e-learning, we used our research resources to focus on this group, while using knowledge from SST research to take account of the critical role played by others in the innovation process in order to detect more general patterns and issues. We examined the diffusion and use of a proprietary, commercially-marketed VLE at a private US university. To protect the confidentiality of our respondents, individuals involved are kept anonymous and fictitious names are used for the university (‘North East University’ (NEU)) and VLE (‘eClass’). We chose NEU because eClass had appeared to diffuse rapidly within this university. The principal organizational actor at NEU was ‘the Centre’, which was responsible for the use of ICTs in teaching and research. As the study progressed, we discovered the diffusion and impacts of eClass were more limited than anticipated, which shifted the focus of our study on the social and institutional factors constraining this e-learning innovation as well as the likely impacts for the most innovative adopters. asking them to complete (in about 15 minutes) a Web-based questionnaire, asking for information such as participants’ use of eClass and their overall usage of personal computers and the Internet. Two reminders were sent, yielding a response rate matching half of the estimated population. In addition, we conducted in-depth embedded case studies (through interviews of about an hour each). These involved 20 instructors who were among the most intensive or creative eClass users. These surveys and interviews were complemented by interviews with key staff of the Centre. We also attended training sessions and eClass courses, enabling more participantobservation of these events. These sessions created many opportunities to speak informally with eClass technical specialists, department coordinators and users. Finally, we reviewed the content of selected eClass course sites, focusing on sites of our embedded case studies. Survey responses from 225 individuals were gathered from January to March 2002, representing about a 50% response rate, based on our estimate of the number of actual users. Of these, 191 were completed fully and the rest were typically from individuals ‘registered’ for eClass but not actually using the VLE. The Centre introduced a trial version of eClass at NEU in the Spring 1999 semester. Workshops and training sessions for faculty and instructors plus general word-of-mouth recommendations led to rapid growth over the next two years, from six at the start to over 1000 by Spring 2001 (Figure 1). Despite continuing growth in demand, in Spring 2001 the introduction of new courses was stopped because eClass had reached the limit of the pilot version’s capacity. The Centre therefore upgraded in Summer 2001 to a newer version that could support many more courses. When the Centre began migrating older courses to the new system, implementation problems arose that caused many instructors to abandon their use of eClass because they were no longer able to use it effectively. not used by teachers, along with some of the Centre’s own internal training courses, some mislabelled courses and various test runs. Once these were eliminated, the diffusion curve of eClass remained substantial, but significantly less widespread than had been commonly understood (Table 1). In analyzing eClass courses in more detail, we uncovered multi-layered levels of innovation. In the spring of 2002, 6,814 courses were offered at NEU, with 752 (about 11%) registered for eClass. Of these, 700 actually used eClass, accounting for about 110 teachers among a faculty approaching 2,000. However, in line with the general perception that eClass was diffusing rapidly, our survey respondents believed eClass was used by many others: 19% said all courses in their department were using eClass and 35% thought most courses were using it. Only 13% said eClass is rarely used in their department, which is probably closer to the reality. Moving beyond mere adoption to look at actual usage, we found that most did not make extensive use of eClass, although some did. This is one reason why we decided to conduct a selected number of embedded case studies to see how active eClass users applied the VLE in their courses. We also sought to discover emerging patterns of use. 4. Perceptions of the helpfulness and value of the VLE Questionnaire responses indicated that eClass users spent an average of 2 to 3 hours a week on the system (Table 2), with 60% using it for no more than 2 hours per week. Instructors had used the system for an average of two semesters in about three courses; just 26% used it for three or more semesters and 31% for only one. Factor analysis among the motivations identified convenience and effectiveness as two relatively independent defining groups of characteristics affecting attitudes towards eClass (Table 5). The most widely perceived changes tied to eClass were the respondents’ use of time and the geography of teaching and learning. The activities that had increased most by the use of eClass were being online, communicating with students and emailing, followed by increases in the time spent preparing for class and working from home and at the office (Table 6). These also indicate more time at the computer, or what might be called a growth in more computer-centric work patterns. Access to a wide variety of computer and Internet resources are critical enabling factors in e-learning. We found a clear positive correlation between instructors’ use of eClass and other computer-based instructional technologies, such as email, presentation software and the Internet/Web (Table 7). For example, almost all eClass users had a computer at home, 46% had broadband Internet access at home and 76% had a portable computer. Except for white boards, more traditional non-computer-based media had lower rates of use among the users of this VLE. differentiation between more computeroriented and non-technical schools. feature was that eClass was used mainly to enhance and complement traditional forms of classroom teaching (see also Morgan 2003). To help illustrate each pattern type, the following descriptions include some hypothetical instructors based on a composite of actual users. Box 1: Patterns of eClass use ONE-MANY Type 1. eCopier: use of courseware to replace the copy machine. Type 2. ePublisher: creating electronic content for students. Type 3. eProjector: replacing the 35 mm projector. MANY-MANY Type 4. eProject: facilitate team projects outside of the class. Type 5. eTeam: student initiated virtual study group. Type 6. eClassroom: use for distance and distributed learning. eClass was used most often as an alternative to the copy machine, by providing students with online access to assignments, readings, lecture notes and other class documents. This was typified by Professor 1, who felt the system simplified his work and enabled him to concentrate more on his research by freeing the time he previously spent using the copier. He also employed eClass’s interactive functions, such as group discussion and asking students to post additional links to relevant materials. Despite these innovations, his teaching was unaltered and he confesses that eClass is more helpful to him than his students. class by regularly discussion sessions. Assistant Professor 2 believes eClass has enabled him to spend more time teaching and preparing for class. Despite some technical problems, he is convinced that evaluations and polls of students reflect favourably on his use of eClass. He senses differential use, with good and conscientious students using eClass to their advantage, while poorer students do not make the effort to engage with their fellow students. Professor 3 teaches in the art history department, so is interested in the technology’s obvious value in handling visual images electronically. eClass has been very helpful to her and her students by giving online access to high-quality images they could previously see only at a library or museum, or in relatively poor-quality reproductions. She found that online discussions were not important to the class and were monopolized by a few students. She rarely used other eClass features. Professor 3 believes that eClass has changed the time and place of her work, as she can prepare visual images for her classes online from home rather than at the University or a library. However, she is concerned that using eClass has reduced interpersonal interaction with her students. Assistant Professor 4 teaches accounting primarily with undergraduates He uses eClass for Type 1 e-copying but sees its main value lying in the discussion board, as it helps students to learn how to work with technology in virtual teams. For instance, students are required to post their solutions to assigned problems on the discussion board so that other students can comment. He believes this exercise of peer critique assists the development of a “spirit of excellence”. In a central part of this course where students must work in small groups to analyze case studies, eClass functions as an electronic gathering place for students who do not wish to meet on campus. Professor 4 can occasionally check students’ progress by accessing all the archives of the discussion board and virtual classroom meetings. In at least one case, students obtained permission to reconfigure eClass software to form a virtual student study group. These computer-science graduate students were working on a group project to evaluate the use of various courseware systems. Although their instructor did not utilize eClass, the group decided they wanted hands-on experience of such a system. The Centre provided them with an eClass account, which they used on a regular and frequent basis for personal group discussions and research. The students’ team leader said eClass facilitated online group discussions by giving flexibility and convenience in scheduling discussions because group members did not need to be on campus for meetings. For instance, using the virtual chat feature for fruitful discussions online with colleagues accustomed to working late into the night. The group also posted relevant papers and external links online via eClass, enabling them to maintain an evolving group-reading list that eventually helped them to write the literature review for their final paper. Their use of eClass also aided them in critically evaluating the system and offering suggestions to the Centre for improving the software for student use. learning. For instance, Professor 6 used it to create a ‘semi-distance’ approach for a Technology in Contemporary Education and Training course for 40 graduate students. This restructured the courses he had taught for 20 years in a traditional classroom setting. Materials for the course, including online instructions, assignments and course readings, were filed in an ‘evolving’ workbook on eClass. Students on the course have to meet on campus only a few times a semester, including an initial orientation session, a mid-semester ‘get-together’ and a ‘wrap-up’ final session. They use eClass for individual work and small live and/or electronic work groups. Their final product is a student-created portfolio of work presented in class as a PowerPoint presentation and posted on eClass for others to review. Professor 6 sees his role as a “facilitator of learning”. He is available on campus during weekly office hours, schedules virtual office and classroom meetings via eClass and encourages interaction via email, telephone, fax and post. Two teaching assistants offer administrative support to help him respond to students efficiently and with personalized care. One summer he taught the same course with students from other universities in a complete distance education format, in which he substituted the campus meetings with interactive television sessions. factors constraining innovation that had led to the conservative patterns we found in this context and to appreciate how addressing these potential constraints could release spread innovations that are valued by key actors. and represented a more substantial barrier than anticipated. Moreover, these were barriers that could not be overcome simply by technical know-how on the part of instructors. Ensuring the technology works smoothly and can be easily operated and flexibly tailored by users remains as a difficult challenge, but its accomplishment could greatly improve opportunities for more radical changes. Continuing advances in courseware and the wiring of households, classrooms and universities, such as through innovations like wireless networks, could help to achieve far greater take-up, and more imaginative uses of VLEs by diminishing many of the types of technical limitations encountered in the case we studied. Electronic Journal of e-Learning Volume 2 Issue 1 (February 2004) 69-80 more quickly or professionally, but with more expensive technologies (Dutton 1999, p 216). It takes time for individuals to discover how new technologies enable them not only to do things in new ways, but also to do new things. instructors actually used the system. Such difficulties for top university management in enforcing particular policies means successful innovation cannot usually be imposed from above, but depends on diffusing new ideas among the rank and file. Copyright was mentioned explicitly as a constraint on innovation by only one professor in our study. However, this is one factor that has made the copy machine less useful to instructors and one significant uncertainty surrounding the provision of electronic access to course readings, images and lectures. 9. Emerging opportunities and problems The pilot eClass system at NEU was not ready for widespread deployment at the time of our study. Nevertheless, among the predominantly traditional approaches to using eClass we did discern emerging opportunities and problems in e-learning innovations that we believe are relevant throughout higher education. First, we could not dismiss the value that instructors placed in a VLE supporting traditional tasks, such as in distributing their required readings. Efficiency and medium matters, especially as teachers and students expect more material to be online. In the long run, this is not simply an enhancement of the efficiency of copying functions, but an adaptation to a more fundamental change in how students prefer to get access to course materials, which could have dramatic implications on the geography of access, such as where students study. Secondly, the degree to which the lack of access to other ICTs undermined the use of VLEs and vice versa suggests that VLEs are likely to become more central as laptops, wireless and multimedia classrooms continue to diffuse. This is already apparent in high-end multimedia classroom environments, where access to the Internet, VLEs and other multimedia systems can create a synergistic effect on the use of each technology. It is in these classrooms that the students appear to gain the greatest role in managing information and communication resources in a multimedia, multitasking environment, for better or worse. Box 2 summarizes the main factors we think must be addressed in an e-learning strategy aimed at nurturing the opportunities and reducing the problems. Box 2: Strategic e-Learning policy aims Accept the continued value of traditional educational paradigms in guiding early use of VLEs and explore new possibilities as instructors gain experience and experiment with other new ICTs, such as wireless. Rethink teaching practices embedded in university cultures and rules that make innovation in online learning difficult. Enable new forms of content and communication media to support new educational patterns and paradigms, such as group work and multitasking. Diffuse e-learning innovation by motivating grassroots take-up of new electronic media, as elearning policies cannot be imposed top-down. Offer ample training and support to encourage better management of information and communication as a university becomes more dependent on ICTs. Complement e-learning with appropriate face-to-face contact. Provide sufficient resources to support effective innovation not only in the classroom, but also in the offices, libraries, households and dormitories of students and teachers. Do not expect an overnight revolution, as much time is needed for teachers and students to understand how to utilize e-learning capabilities fully. Identify, target and support key likely benefits of e-learning, such as saving teachers’ time, supporting individual and group student working and opening new ways to reconfigure the geography and timing of class activities. Centre staff at NEU concluded that the findings of our research underscored the need for training to extend beyond the knowledge of how to use its features. We found no evidence of what Pea (in Perkins 1990, p.21) calls the “fingertip effect” that occurs “when administrators and teachers presume that people will automatically take effective advantage of the surrounding new media just because it is there to take advantage of”. New techniques for screening, filtering and prioritizing information and communication demands will also become ever more critical to effective learning. Despite the many technical glitches and limitations of eClass, its restricted capabilities were still valued by most users. This has been supported by other studies of VLEs (Kent 2003; Morgan 2003). This indicates that the value of such courseware to academic staff and their students is likely to increase as the technical constraints are addressed. The growing availability of more online content and better communication facilities is also likely to move e-learning more centre-stage in higher education. This could lead eventually to the emergence of sustainable new e-learning paradigms. These are illustrated by the emerging subtle shift we found from one-tomany to many-to-many forms of teaching and learning, as well as by signs of an emerging multimedia-multitasking classroom in which students are online – in class as well as out of class. innovatively by a few. The embedded case studies added a ‘human face’ to the social and institutional factors affecting an e-learning innovation such as the introduction and use of this kind of courseware. This showed that a great deal of optimism about e-learning opportunities at NEU had been dampened by a variety of specific technical, institutional, economic and other social constraints. As a result, the VLE was limited to uses that primarily supported traditional patterns of classroom instruction. Research by others has also noted this conservative role of e-learning in support of traditional classroom activities, in what some have called ‘blended learning’ (e.g., Crook and Light 2002; Morgan 2003; Williams 2003). The NEU case shows the value of the SST framework in fostering a rounded assessment of change that reveals the key social and technical dimensions that need to be understood and addressed if innovations like eClass are to fulfil their potential for enhancing learning and education. 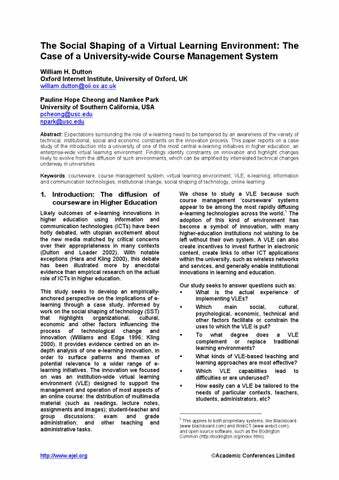 For instance, the relatively limited use of the VLE at NEU in the time period of the study does not support the anti-technology stance of some critics of the more visionary, technology-driven predictions for e-learning. But it does back the view that educational institutions are not just providers of information or codified knowledge, but are vibrant learning communities offering contextual and social cues that are vital to shaping learning and education outcomes (Brown and Duguid, 2000). VLEs can be used, and were used at NEU, for supporting communication, study groups and learning communities in valuable new ways that can complement traditional media and methods, rather than replace them. The in-depth case study was sufficiently rich to provide substantive evidence to identify some important general themes and patterns. However, we are aware that our findings need to be refined and expanded on by further research on the many relevant institutional, social and technical dimensions highlighted in this case. For instance, much of our study was seen primarily from the instructor’s viewpoint. Further research should explore the use of courseware from the perspectives of administrators, students, technicians and other actors. Comparative research on the diffusion of educational technologies in institutions at all levels, starting from elementary schools, and studies lasting for longer time frames than available to us could also help to better illuminate the unanticipated consequences of e-learning innovations like the VLE in our case. Investigations into interactions between a VLE and other innovations in the use of wireless networks, laptop computers, and other new ICTs in higher education could also improve understanding of how more innovative elearning approaches can be fostered, even in environments strongly influenced by traditional educational paradigms and teaching methods. 11. Acknowledgments: An earlier version was presented to the 2002 European Conference on e-Learning at Brunel University. The authors thank Malcolm Peltu and our anonymous reviewers for their assistance in the preparation of this manuscript. Massachusetts: MIT Press (2004), pp forthcoming. Dutton, W H and Loader, B D (eds.) 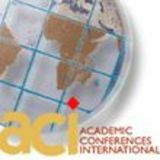 Digital Academe: New Media and Institutions in Higher Education and Learning, Taylor and Francis/Routledge, UK (2002). Hara, N and Kling, R ‘Student distress in a web-based distance education course’ Information Communication and Society, Vol 3 No 4 (2000) pp 557-579. Kent, T ‘Supporting staff using WebCT at the University of Birmingham’ Electronic Journal of eLearning, Vol 1 No 1 (2003) www.ejel.org Kerr, S T ‘Toward a sociology of educational technology’ in D H Jonassen (ed.) Handbook of Research for Educational Communications and Technology, Simon & Schuster Macmillan, USA (1996) pp 143-169. Kling, R ‘Learning about information technologies and social change: the contribution of social informatics’ The Information Society, Vol. 16 No. 3 (2000) pp. 217-232. Layton, D ‘Technology and the classroom teacher’ in T Husen and T N Postlethwaite (eds.) The International Encyclopedia of Education, Vol. 11 (2nd edition) Pergamon, USA (1994) pp 6283-6292. Levin, D and Arafeh, S Digital Disconnect: How Students Use the Internet During School. Pew Internet and American Life project. www.pewionternet.org (2002). Morgan, G Faculty Use of Course Management Systems. Paper published by the Educause Centre for Applied Research (ECAR), Washington DC and Boulder, Colorado (2003, May). Perkins, D N Person Plus: A Distributed View of Thinking and Learning. Paper prepared for the annual meeting of the American Educational Research Association, Boston, USA (1990). Williams, R ‘Editorial comment’ Electronic Journal of eLearning Vol. 1 No 1 (2003) www.ejel.org Williams, R and Edge, D ‘The social shaping of technology’, in W H Dutton (ed.) Information and Communication Technologies: Visions and Realities Oxford University Press, UK (1996) pp 53-68.